We love Tim Burton’s The Nightmare Before Christmas in this house. So much so, that, as I mentioned before, my son has his entire room decorated in memorabilia and trinkets from the movie. There’s not a lot of space on the walls to add to his collection anymore, but we recently found something that would be the perfect addition to his collection. 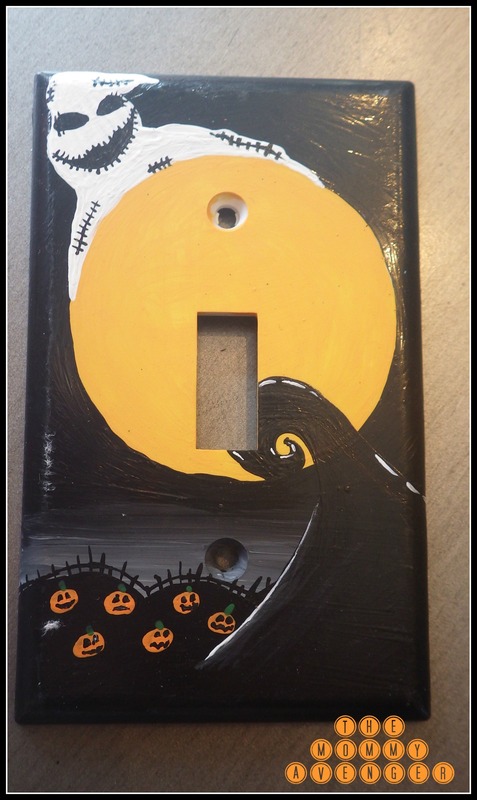 CraftsByKym, a great shop on Etsy, boasts hand painted light switch plates, including this impressive Nightmare Before Christmas inspired piece of art. We were sent one to check out* and I am thrilled with all the great detail. I never would have thought to add to his collection through a light switch cover, but it is the perfect piece he was missing. Ordering a light switch cover from Kym was a very pleasant and quick experience. Kym is an artist working her way through school, so each purchase through her shop is helping her obtain her education, as well as adding an awesome piece of art to your home. If you have seen a piece, like this Nightmare Before Christmas scene, on her site before, but she no longer has it listed, no worries, simply write her and she can create one just for you! My son was so excited to get this switch (who knew that a light switch cover could be so exciting?) and loves seeing it in his room. I highly recommend Kym’s shop and her work, as she did an excellent job. Not only does she have The Nightmare Before Christmas products, but lots of other pop culture covers, too. Check out her shop and have fun picking out something unique and fun!